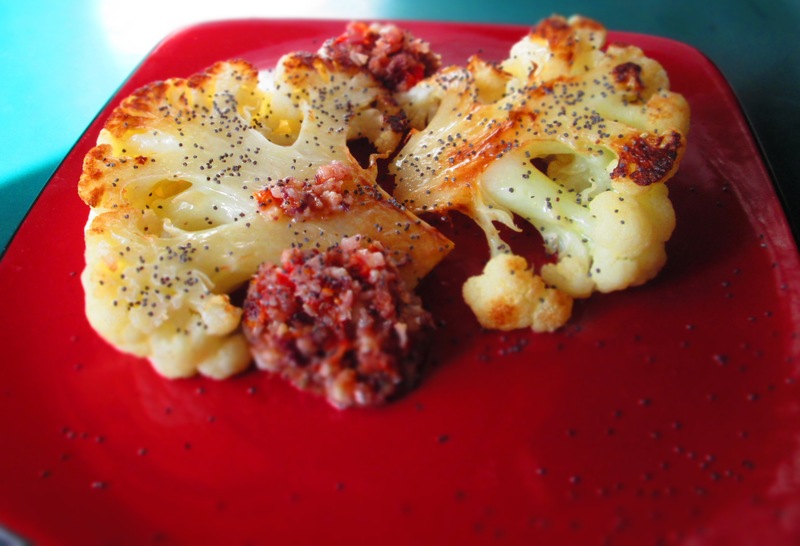 Cauliflower steak is a mainstay of many vegetarian and vegan restaurants. I think it’s because once you’ve worked your way through a big slab of cauliflower, you find yourself full and satisfied. Don’t get me wrong, I’m not claiming that a cauliflower steak gives the same feeling of satisfaction that of a regular steak or that it’s a comparable substitute in any way, but for vegetarians, it’s a hearty and delicious option. Categories: Dressings, Gluten-free, Healthy Alternatives, Healthy eating, Recipes, Savory Cooking, Uncategorized, Vegan, Vegetables, Vegetarian | Tags: cauliflower, dressing, olives, steak, sun-dried tomatoes, vegetables, vegetarian | Permalink.